The volume of internet advertising reached CZK 15 billion last year. Compared to 2014 this represents a 3 per cent growth that was caused primarily by increased advertising expenditures in search advertising and content networks, video advertising, RTB and mobile display advertising. Expectations for the coming year are also optimistic, the survey participants assume that online advertising will continue to grow by 11 per cent to CZK 16.7 billion CZK. Out of the total advertising expenditures, online advertising accounts for a 20 per cent share. 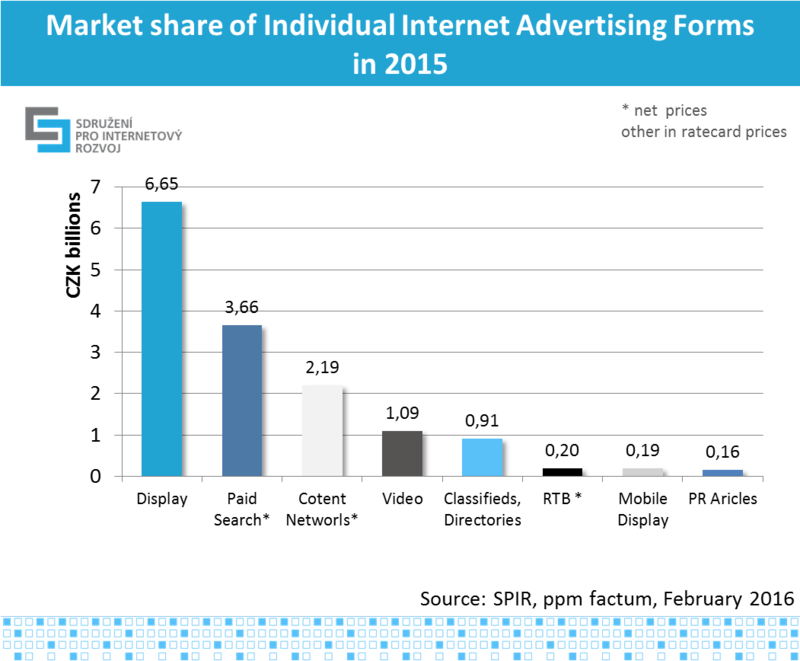 The data come from the annual survey of Internet advertising performance conducted for SPIR by the Ppm Factum Research Agency. 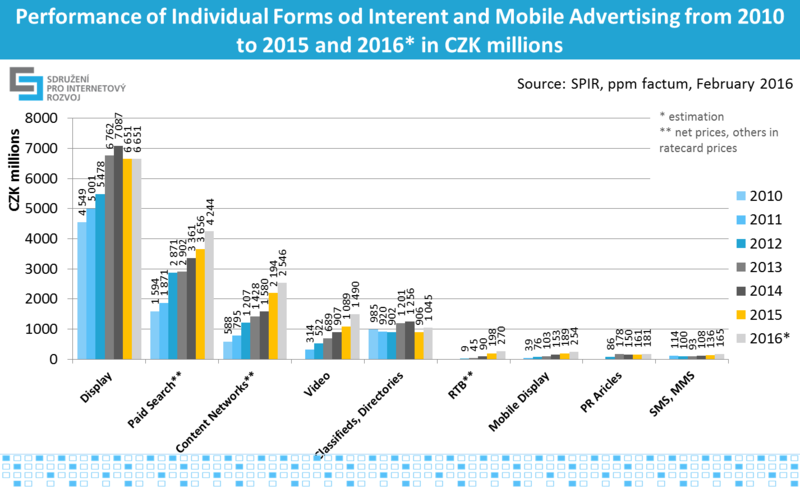 In 2015 advertisers used online advertising in the volume of CZK 15 billion. This is by 3,2 per cent (CZK 460 mil.) more than in the previous year and confirms the ongoing growing trend in the use of online forms of advertising. The largest part of advertising expenditures is attributable to display advertising (CZK 6.65 billion) and advertising networks (CZK 5.85 billion) including paid search (CZK 3.66 billion) and content networks (CZK 2.19 billion). If compared to the last year, display advertising shows a 6 per cent decline, while advertising networks (including Sklik, AdWords, Facebook and eTarget) has grown by 18 per cent. Over one billion of Czech crowns (CZK 1.09 billion) is attributable to video (in-stream) advertising that has recorded the annual growth of 20 per cent. 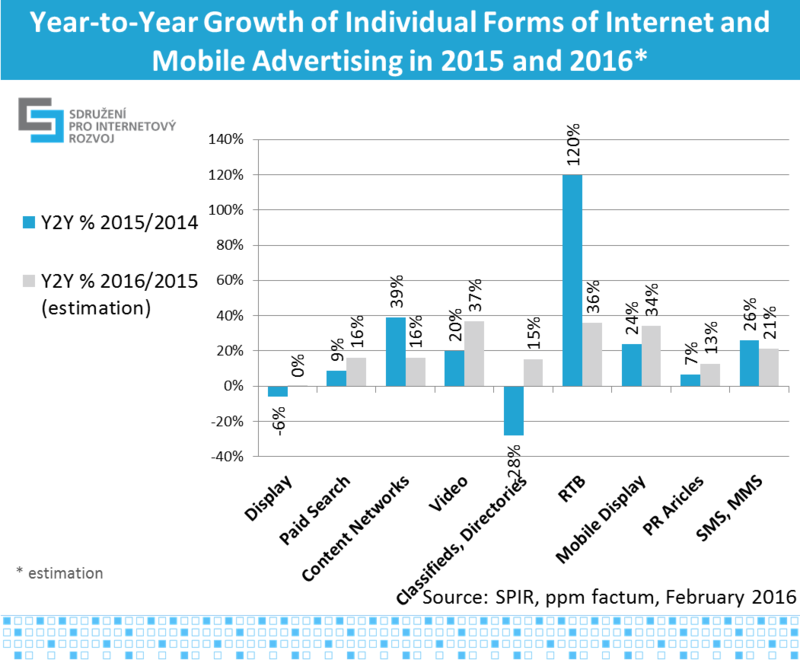 Advertisers continuously spend more money on video and mobile advertising on the internet. In the past three years (since 2012) the performance of video advertising increased two times and mobile advertising 2.5 times, up to CZK 1.09 billion and 189 mil, respectively. PR articles expenditures represented CZK 161 million of the advertising budgets. The mobile advertising volume is coming from the participating media and shows the volume of advertisements placed on websites and accessed from mobile phones and applications. Mobile advertising (phones and tablets) in search and content networks is included in the respective categories “Search” and “Content Networks” and as stated by the respective agencies, has a 20 per cent share in this category. RTB model advertising recorded the highest growth. The last year’s CZK 198 million in real prices is based on estimates of media, i.e. the advertising space offer. Moreover, SMS and MMS messages in operator networks reached the amount of CZK 136 million in the last year. Out of all the monitored forms of advertising the highest growth of volume (more than double) was recorded by the RTB model of advertising. Positive development trends are shown also in mobile forms of advertising (24 per cent growth) and video advertising (20 per cent growth). Search advertising has grown by 9 per cent up to CZK 3.66 billion and content networks by 39 per cent up to CZK 2.19 billion in real prices. Advertising in networks (search and content networks together) has grown by 18 per cent up to CZK 5.85 billion in real prices and for this year is estimated to grow by 16 per cent. For the purpose of comparing the volume of advertising in individual mediatypes, data derived from the Nielsen Admosphere monitoring of advertising expenditures were used. TV advertising maintains its dominant position in the advertising market (45 per cent). Press advertising reached CZK 17.9 billion and has a 23 per cent share in advertisement budgets. Online advertising has a 19 per cent share (CZK 15 billion). 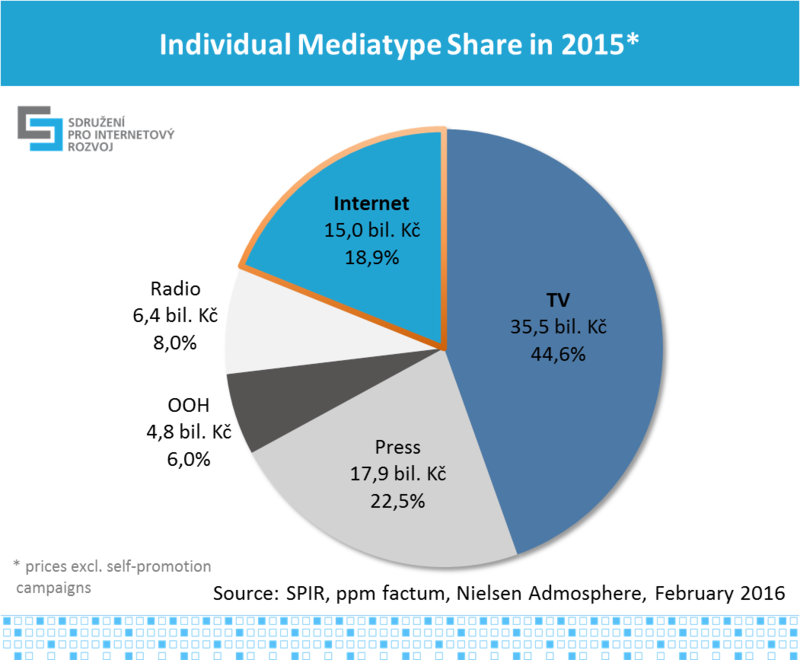 Radio advertising reached the level of CZK 6.4 billion (8 per cent) and OOH advertising CZK 4.8 billion (6 per cent). 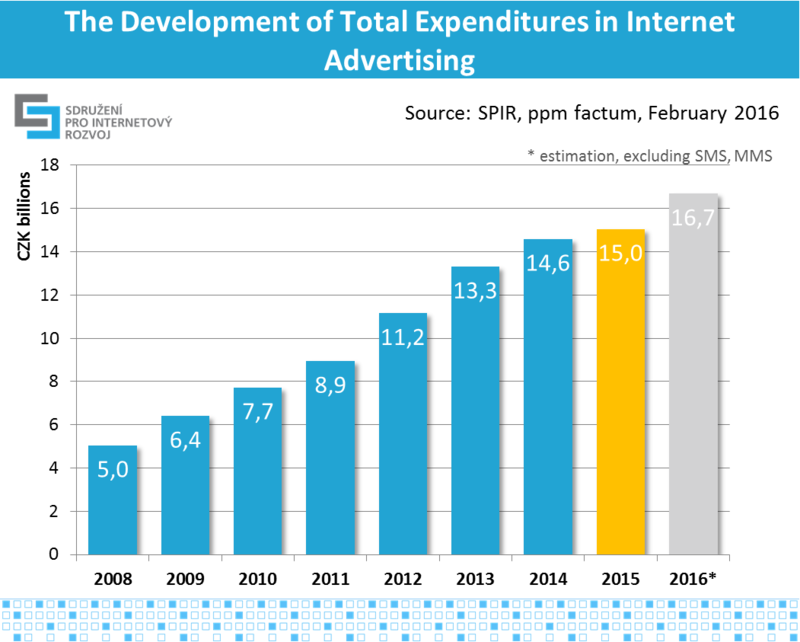 Since 2008, when the SPIR online advertising performance survey started, we note a long-term growing trend of expenditures in internet advertising. 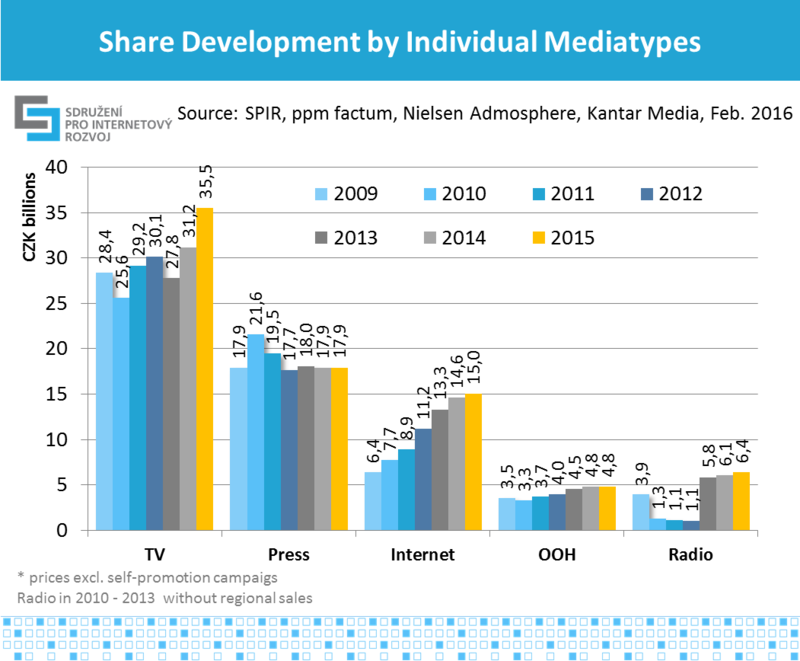 During the past three years expenditures in TV advertising have also increased. Both the press and OOH advertising stagnate. Performance of mediatypes is stated in ratecard prices and does not include self-promotion. Internet display advertising: Banner advertising in standard (banners, skyscrapers, leaderboards...) and non-standard formats (overlays, interstitials) and video banners. Paid search advertising: Advertising appearing on specific word requests on search engines or premium positions. Content network: Contextual advertising appearing on websites according to the content displayed to the user that is selected and served by automated systems using also classical banners display formats. PPC: This kind of advertising usually has a performance model for the payment of advertising, in which payment is made per click or actually delivered traffic, not for the number of impressions or the time interval as is the case, for example, with banner advertising or preference entries in directories. As opposed to the display advertising, its characteristic includes sale in real prices of advertising. It is used in search advertising, content networks and RTB. Video advertising: Video advertising: is sometimes considered to be a constituent part of display advertising, however, for the purpose of the research it is monitored separately and includes In-stream video spots (pre-rolls, mid-rolls and post-rolls) appearing before, during or after a video content in the player or an overlay ad or video banners. Mobile advertising: Mobile advertising: advertisements displayed in the course of internet browsing via a mobile device (phones or tablets) and advertisements targeted at mobile devices in search advertising and content networks. The present survey treats separately only mobile display advertising. Advertisements targeted at mobile devices in search advertising and content networks is included in the networks. RTB (real-time-bidding) is a type of business model for selling banner advertising targeted at desired audience. In RTB, advertising is sold according to the number of impressions, where each impression is delivered in real time by automatic systems as is appropriate for the required target group. In the RTB model, geographical, linguistic or behavioural targeting of advertising is often used, on the basis of previous activity and the interests of the user. The main characteristic of the RTB model is the auction sale in real prices of advertising. Online classifieds: paid advertisements in databases of products. Directories: online versions of printed yellow pages (business listing paid for by advertisers). PR articles: Paid advertising articles placed amount content articles on the media. SMS/MMS: paid advertising SMS and MMS distributed by the operators’ networks. The advertising performance of SMS and MMS is not included in the total volume of the internet advertising. While surveying and processing the results, in the interest of objectivity and the protection of sensitive data, the Ppm Factum agency was commissioned. The survey was conducted during January and February 2016, so that it was based on current closings of individual subjects. The performance of all types of advertising was based on declared performance of individual providers of content, agencies, and operators of advertising networks and mobile operators. From 57 important internet operators, who were addressed, 25 became actively involved; their media have impact on vast majority of Czech Internet users. All 3 addressed mobile operators provided financial data related to SMS and MMS advertising messages. In order to obtain data on the performance of individual advertising networks, three operators and 53 agencies (media, specialized SEM, web-development were addressed). One operator of an advertising network (Sklik of Seznam.cz) and 24 agencies undertook active participation. To calculate the total advertised amount in advertising networks, the claimed performance of the Sklik advertising network is used; along with the weighted average of the percentage distribution of spending by agencies into advertising networks . Expert estimation was used for breakdown of performance into search and content networks. Three agencies and six operators did not provide their results; therefore data obtained during previous surveys were used. The outputs show various types of online advertising, using two various prices. In order to arrive at one aggregate number for all forms of internet advertising for the purpose of comparison with other media types, we had to add up the real prices of advertising performance in paid search and advertising networks (no ratecard prices exist) with the ratecard prices of all forms of internet advertising Raising real prices with performance advertising by a hypothetical margin and so improve the overall Internet budget would not be correct. With respect to other media types, estimates of real prices are not available. The overall performance of the internet does not include SMS and MMS campaigns, which cannot be considered as a type of internet advertising. Description of forms of the internet display advertising is to be found here.